Purification: Out out damn Words, a photo by timtak on Flickr. 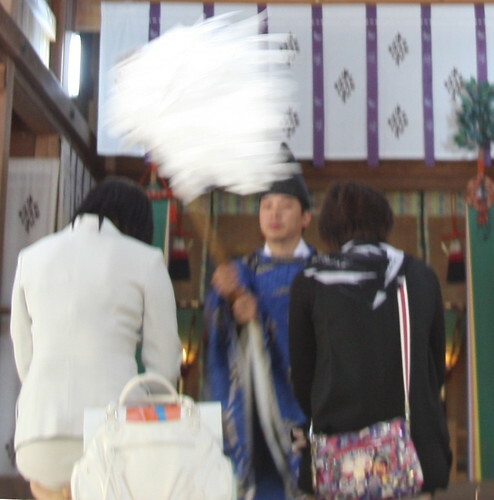 Since the wands are pieces of paper, and the pieces of paper are sometimes used (I believe) to write words, and sometimes one writes one desires and leaves at shrines I think that the purpose of the sweeping purification may be to wipe the words, or symbols out of ones mind. If you are able to get the words out of your head, then Shrines and the world looks more like the mirror. When words are reduced to the externalities that they are, used for communication, for transmission between one place and another, as they are in Shinto, such as when one moves the spirit of a deity from a shrine to a home, vectored by a "Shinpu" or sacred stamped piece of paper, then science becomes the mass of hypotheses that it is, and the "real world" as obscure and irrelevant as Nietzsche believed. On the other hand, if the mirror is sacred, and you are taught to believe that there is always someone, a neighbour, an ancestor, something looking, then unlike Nietzsche, you will not have abolished the "apparent world" too.